Crisp clean highs, tight bass response out of a tiny enclosure. ADST bought out by Directed Electronics, customer support is certainly no where close to what it used to be. No parts available - C'mon get with it Directed! I have been a long time fan of a/d/s speakers their clarity and detail is hard to beat. In the mid seventies I used a pair of 200's in my car and they sounded like a pair of 6x9's mounted in a trunk, amazing! The sound that these little wonders can reproduce will utterly amaze you. The bass response is solid and tight the highs clean and crisp. If you are looking for some mini speakers that can keep up with speakers many times their size these are the ones you want. I have two pair that serve rear surround/effects duty in my home theater they are being fed from 125-150 watts a channel of clean power and have no trouble with it at all. The even have the receiver parameters set to "large" so more bass frequencies can reach them. With music they really perform, I quite honestly can't think of a better mini speaker being made that can compare to the a/d/s. Yes they may cost a little more new, but they are worth it. On a sad note ADST the company, was bought out by Directed Electronics and they do not stock any spare parts at all. So if you blow a driver, it will have to be reconed now. HUGE soundstage for it''s size, smooth top end, heavy build quality, power handling capabilities. well, i will be the first to step to the plate on these speakers. i already had a pair of the a/d/s L520''s that are 20+ years old and still running strong. i wanted back surrounds that would match tonally with these. i was using polk rt15''s which i am not too fond of. they seem to have a suspect top end that rolls off the upper frequencies. kind of a dull sound to them. anyways, recently i realized that a/d/s was still in business and producing small speakers. i thought they were extinct, therefore my reason for NOT purchasing these originally. i love these speakers. they produce a hugh soundstage for such a small speaker. they also have the ability to handle a lot of power. the tweeters are the exact same soft dome type as my L520''s so they blend in perfectly when listening in 5 channel stereo on my onkyo receiver. 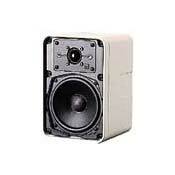 they produce smooth high frequencies, which has always been a trademark of a/d/s speakers. the heavy aluminum casing is a plus as well. these can be used outdoors. i have them resting on bookcase shelves and there is little or no vibration resonating from these. the heavy metal casing is the reason why. put a typical pair of wood veneer speakers on these shelves and i guarantee they will resonate at high volumes when the bass response is working hard. i know bookcase shelves are not the ideal placement for these. they should be on stands or hanging on walls but i don''t have extra space for stands and i don''t feel like putting any more holes in my walls! i see older a/d/s speakers selling on ebay all the time. i suspect one of the reasons is that some of these people want to build a multi-speaker ht system and don''t realize they can still get a/d/s speakers to build around their main pair! a/d/s sells center channel speakers as well. i have one of those as well. i am one of the very few that actually has an all a/d/s home theater system of which i am very proud of. these speakers are an under-rated gem, especially for their size. i will warn you that they are 4 ohm impedance but i have no problem powering these with my onkyo receiver. these are a/v shielded so putting them next to a tv is a viable option.